Stearman! – Dave Groh turned the remnants of another PT-17 project into a finely restored work of art. Greg Morehead caught up with him to shoot some spectacular photos of the finished product and Groh relates the restoration story. Although it was the most produced American combat aircraft, few B- 24 Liberators escaped the scrap man. Warbird Digest briefly surveys the intact survivors and provides an interesting look at the source of nearly half of the existing airframes. If you love the Hawker Sea Fury, you have heard of the Sanders family. Almost four decades have passed since the Hawker fighter entered the lives of Dennis and Brian Sanders as a result of their father’s passion. Today the brothers keep the legacy alive and continue to improve and operate the type. 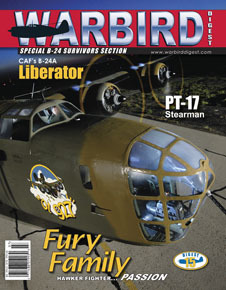 Scott Germain brings Warbird Digest readers the complete story. For four decades the Commemorative Air Force has been operating a Consolidated LB-30 “Liberator.” Over the winter, crew chief Gary Austin and a number of volunteers transformed the aircraft back into the bomber that it was when it left the assembly line in 1941. Dave Groh turned the remnants of another PT-17 project into a finely restored work of art. Greg Morehead caught up with him to shoot some spectacular photos of the finished product and Groh relates the restoration story. Over forty years ago a flying model of a PT-19 planted the seeds for a project that would come to fruition in 2005. Jim Russell brings the moving story of a dream fulfilled.